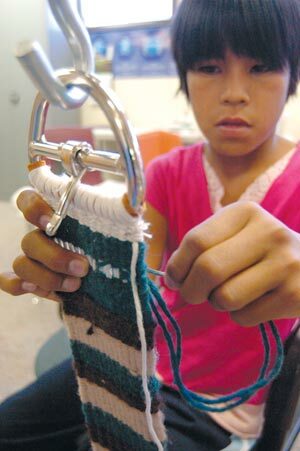 Demarie Hanley, 10, weaves wool to make a cinch in a summer cultural program at Monument Valley High School (Utah) in Monument Valley, Utah. ath, they say, is a universal language, and one way to learn it is entwined with an ancient Navajo art. Recently students from Monument Valley High School and teachers from the University of Utah uncovered this relationship as they set about unlocking Logo, a computer math program, during summer school. Teaching assistant Kimberly Brainard, 23, of Pueblo, Colo., was amazed to see how Navajo weaving designs helped her students "see that math really does apply to real life." Brainard was helping University of Utah professor Douglas Hacker teach the basics of Logo to students and adults enrolled in 'ndahoo'aah, an annual three-week summer program that ended June 22 at the high school. The program is open to everyone in the community from 4th grade through adults. 'Ndahoo'aah means "relearning" or "to relearn" the Navajo way of life, explained Dorothy Bigman, a Navajo language and culture teacher at the school. During the 'ndahoo'aah program, students learn to weave a rug, sash belt, saddle blanket, saddle cinch, or basket. Or they can learn how to make turquoise and silver jewelry or Plains beadwork. Monument Valley Principal Pat Seltzer said the summer program began in 1992 when she accepted an offer from Herb Clemens, who was with the University of Utah's science program, to teach a computer math class with the aid of Navajo rug patterns. Seltzer recalled Clemens explaining to her that he had made his offer to numerous schools across the reservation and none had accepted it. She laughed as she said, "We never say 'no' so we started it." Modern applications of math have always existed in Navajo tradition, though Brainard admitted that it was news to her. But she saw it reflected in the students' quick grasp of Logo, particularly that of Lita Cowboy, 12, of Promise Rock, Utah. Maybe it's in the genes: Cowboy, dubbed this summer's "Logo whiz" by program staff, is the granddaughter of renowned weaver Sandra Black of Promise Rock. Black is known for a three-dimensional rug weaving technique, a complex style that is rare among Navajo weavers, Bigman said. She also credits Black with reviving from near-extinction the art of weaving saddle cinches, which historically was done primarily by men. Cowboy, too, wove a cinch during this summer's 'ndahoo'aah program and recently sold it for $200, Bigman said. Cowboy seemed surprised by all the attention last week and smiled shyly as she nervously bit on the left cuff of her black sweatshirt. After a bit of gentle prodding, Cowboy explained that it was her second attempt at weaving a saddle cinch, and the first in which she had incorporated a design. Then, seated at a computer, she talked about how much she liked math and the Logo program, in particular, swiftly typing in commands that called up her design on the computer screen. Cowboy's shyness slipped away as she explained how she drew her design by hand on graph paper and then transferred it to the computer using Logo. She also showed her design for a rug, which depicted the four sacred mountains framed at the top and bottom by a row of four arrowheads. Cowboy, who is Tó Dích'íi'nii (Bitter Water Clan), born for Tó 'Áhání (Near to Water Clan), designed each mountain with its appropriate color and directional orientation, as defined by Navajo tradition. Brainard said Cowboy had previous experience with Logo and was familiar with geometry but had never used angles. She said that Cowboy, who enters the sixth grade this fall, is excited because her newfound knowledge of angles has put her one step ahead of her class. Teachers also became learners during the program, as Brainard, Hacker and a third Logo teacher enrolled in the Navajo basket weaving class. Brainard laughed and said her hands hurt and her fingers cramped after her first day of basket weaving. Bigman said Brainard, a lefty, has the "rare talent" of weaving a "left-handed" basket. Debra Farr, a teacher from Tampa Bay, Fla., who helps teach the Logo classes, said her basket weaving experience taught her how "geometry was built into the Navajo woman's brain." She also learned the monetary and spiritual value of wedding baskets. "The process is incredible," she said. "It's takes days because it's so labor intensive. Sometimes you don't appreciate that until you do it yourself." Farr, 48, said the basket-weaving students learned how to collect sumac, tear it into splints, strip the bark, clean it and finally begin weaving a basket. Mary Gillis, 67, has taught the basket weaving class for the summer program for the past 12 years. Gillis, Deeshchii'nii (Start of the Red Streak People Clan), born for Nóóda'í Dine'é Táchii'nii (Ute People Division of the Red Running Into Water Clan), remembered with a mischievous smile the day her dad, a medicine man, brought home an "old, old" Navajo basket. He told her to throw it away but she held onto to it and used it to teach herself how to weave a wedding basket, she said. Gillis also remembers watching her paternal grandmother, who was Ute, weaving baskets. "She never taught me," she mused. "Maybe I learned by looking at her." Bigman, who has become the driving force behind the summer program and the bridge between the bila'gáana world and the Navajo world, said the program is very fortunate to have the financial support of the university and Foster Grandparents of America. The university pays the Logo instructors and FGA pays the weavers, basket makers and silversmiths, she noted. Bigman said this together with donations from other groups keeps the cost to $25 per person. The fee is waived for Monument Valley High students.